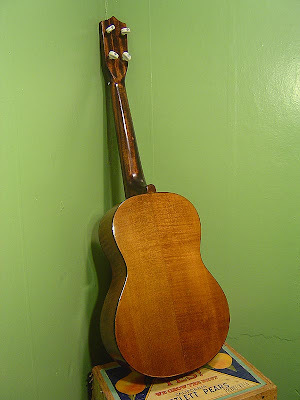 I don't work on near as many baritone ukes as I do normal ukes so it's always fun when I'm pleasantly surprised by one. 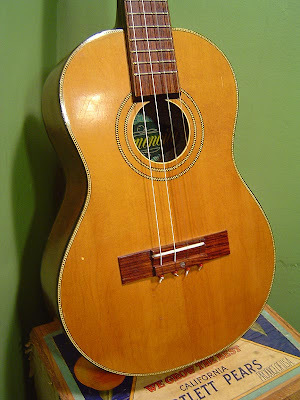 This one in particular is probably an early to mid 1960s model and while it probably wasn't a super-expensive uke in its day, it does have features that are desirable: it has an all-solid spruce top, all-solid somewhat flamed maple back, sides, and neck, a bound rosewood fretboard, bound top and back, checker purfling and soundhole rosette, and rosewood bridge. 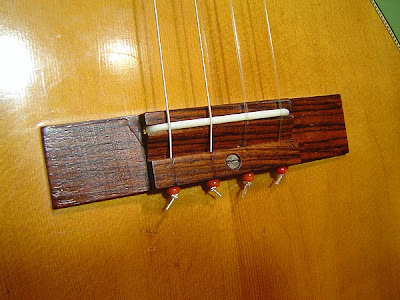 The construction is very tough so I used the A, D, G, and E strings from a D'Addario classical set to string it up. 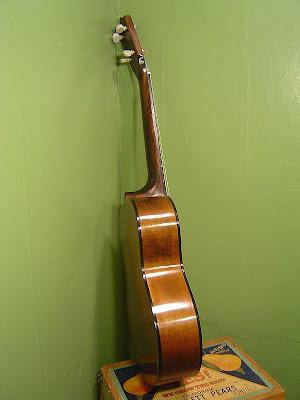 The tone: super sustained, very much like a good-quality classical guitar. Rich. 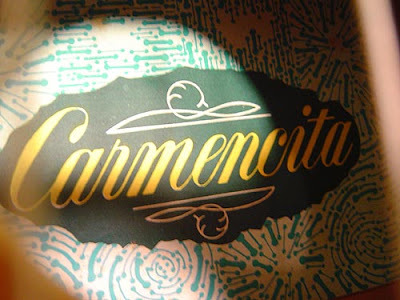 Some folks say Carmencita was a Hofner subsidiary. I know it is now, but back then I'm guessing not. 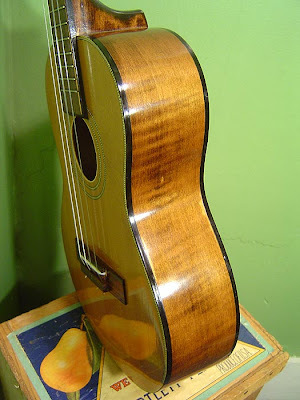 This uke's checker binding and style looks a lot like some Japanese ukes I've seen from the same time period, so my guess is that this was a Japanese creation as opposed to West German. Either way: it's a great player and sounds especially good for melody playing. 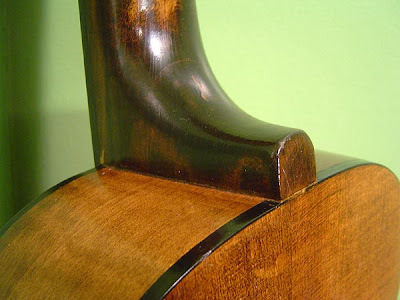 Headstock with curious dark-streaked stain on the neck wood. 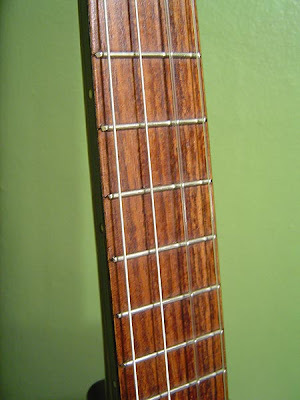 Rosewood bound fretboard with side position dots. 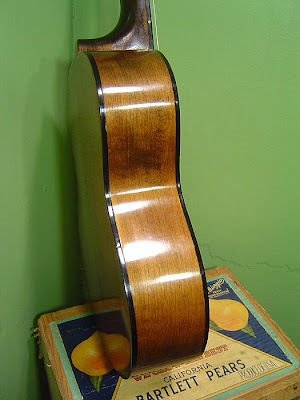 Very cool checkerboard rosette with nice spruce top. The bridge is a typical classical-style one save for the (apparently factory installed) bolt. I've reprofiled the saddle during setup. 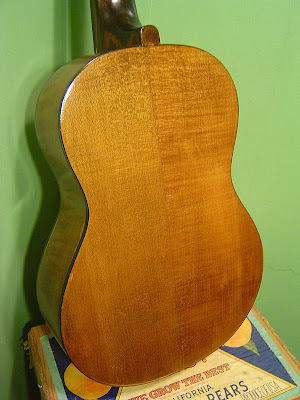 Back detail showing some of the light flame in the wood. If this is Japanese, could this be Japanese maple? 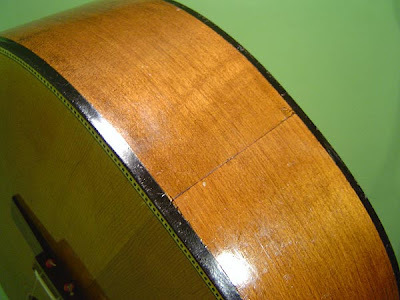 That would explain some of the different (but similar) qualities of the wood vs. typical American hard maple. End join. 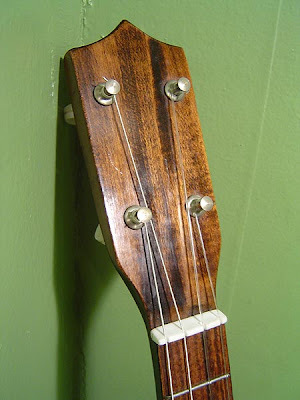 Overall, an unsung, nice-quality player's uke. It's LOUD too! I have just acquired a nearly identical instrument. 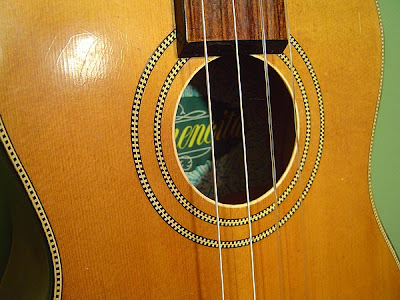 The differences are there is a decal label on the headstock "KENT" in an oval, gold paint, also, the label inside the instrument "Carmencita" is in a dark brown or similar shade on a yellow color ground. That aside it seems to be the same. Is there any value attached to these instruments? 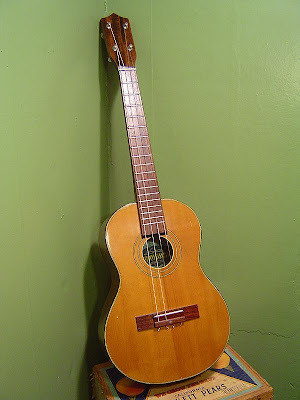 I know that there is a 1/4 sized guitar or similar instrument called a Cuarito, I wonder if there is some connection?